We love our cat! Her name is Yuuki, and she is very unique. After adopting adult cats over many years, we decided to get a kitten, hoping it would grow up loving our aging dog, which she does. Yuuki, or "Lovely Baby", (one of her many nicknames) is the sweetest cat ever, but only to my wife and I. She is wary of strangers. Her fur is extremely soft, and her tail is like a plume, she talks, chirps, and is very gentle with her claws. We aren't sure what the other kittens were, or the parents, but I think she is somewhere between a Birman and Snowshoe Siamese. Her fur was lighter, as a kitten, and has darkened with age. We named our Snowshoe Siamese LeeLoo, she is very loveable and makes a lot of chirping noises and talks a lot. The vet said she was born in October so that would make her 5 months now. Just a little concerned that she may be in heat, but not really sure. I wanted to get her fixed before that happened. The vet said they don't fix until 6 months old so I guess I will just have to wait it out. I too have a rescue cat with bright blue eyes, who I was told was a Snowshoe Siamese. She was beige and white as a kitten and now is dark brown with white and some beige. She has long, beautiful soft fur which is almost like hair. She does have a Siamese sound and even a growl. She is amazing looking and I wish that I understood her mix. She does look like your kitteh. She is beautiful. 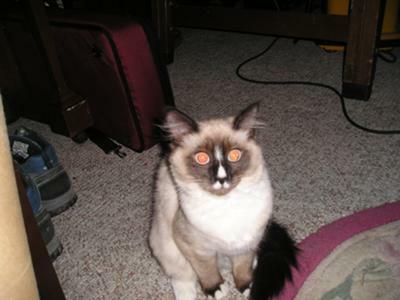 I have a Snowshoe Siamese Persian, I believe. His fur is medium length and not thick like a Persian. 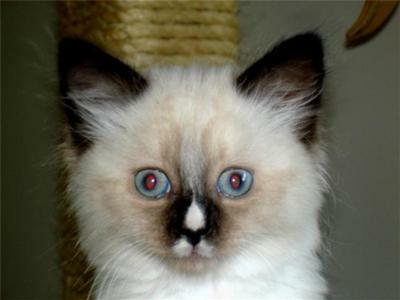 Birman/Siamese - doesn't matter. I'm beautiful! She definitely looks like a Birman. Absolutely beautiful! I have an almost 4 month old cat who's 75% Siamese and 25% Persian (mom was Siamese, dad was Himalayan) and I made a picture of when he was 7 weeks, 9.5 weeks, and 12 weeks to show the difference, and wow do they change! Just looking at your 3 pictures, she got so much darker with age ... can I ask at what age did she stop? She looks like a seal-point Birman. Very beautiful. I think she may have Snowshoe in her because of the timidness with strangers. 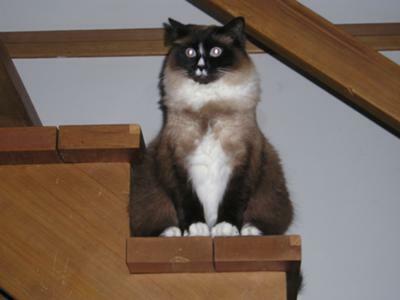 I have both breeds and our Birman loves everyone and our Snowshoe loves only me and hides when strangers visit. I feel pretty ... oh so pretty ....!!! Oh she is so very sweet and beautiful !! How old is she now ?? I know she is a lovely baby! Great photos! Thank you Daniel for your pictures and story of Yuuki - she's gorgeous! 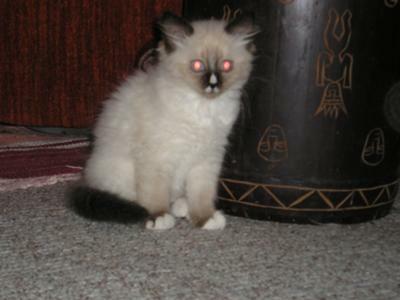 She does look like a Birman or Snowshoe, or might possibly even be a Ragdoll? She looks very like one of the pictures on my Ragdoll page - her face looks similar to the Mitted Ragdoll. She looks very regal in the picture where she is sitting on the stairs. Beautiful.